Chips, fries, call them what you will. All fries are not created equal. This Carrot and Sweet Potato ‘Fries’ with Spicy Peanut Sauce recipe takes all of the good bits of traditional fries – the starchy veg, the crunch, seasoning – and makes them ten times better for you without sacrifice. There’s no frying, and the carbs in these veg are more complex for more even blood sugar levels. I am not a massive carrot fan, and so when I used to buy a large bag, I often ended up with them feeling unloved, wrapped in newspaper in the dark bottom drawer. Now that I have made this recipe, they’re the first thing that gets eaten from my market shop. The peanut sauce is for me the most gorgeous counterpoint to the earthy fries, though I bet they’d be good with ketchup too. The fries won’t be very crunchy if you crowd them, or cook anything else in the oven. They need a really dry atmosphere to crisp up, and anything else will make the oven steamy. Cut your potatoes and carrots up. I don’t peel because I don’t believe in peeling fruit & veg… But you can if you want. Resist the urge to cut the potatoes into triangular ‘wedge shapes’ – this leads to blackened edges and soggy bits. Instead, imagine that you are putting your potato through a sharp grid, like they make chips in a chip shop. Chunky chips, about 1.5-2cm wide with 4 sides are what you want. Imagine your carrots in squared-off batons. Toss just the potatoes in a bowl with 2/3 of the oil and a good shake of salt and pepper. Spread out on a baking tray, giving them plenty of room on the sheet. Cook for 10 minutes. Meanwhile, toss the carrot sticks in the rest of the oil in the same bowl you coated the potatoes in, and a new shake of seasoning. Take your potatoes out, and turn them with a fish slice. Add the carrots to the same tray, still allowing as much room as possible between the batons. If there isn’t enough room, put them on a separate tray. Cook for 10-15 more minutes. Ovens and vegetables vary, so keep a close eye on them the first time or you’ll end up with cinders. 1. Mix all ingredients in a bowl using a fork, then add enough water to make it a good dipping consistency for the chips. Ohhhh yum. These look great! 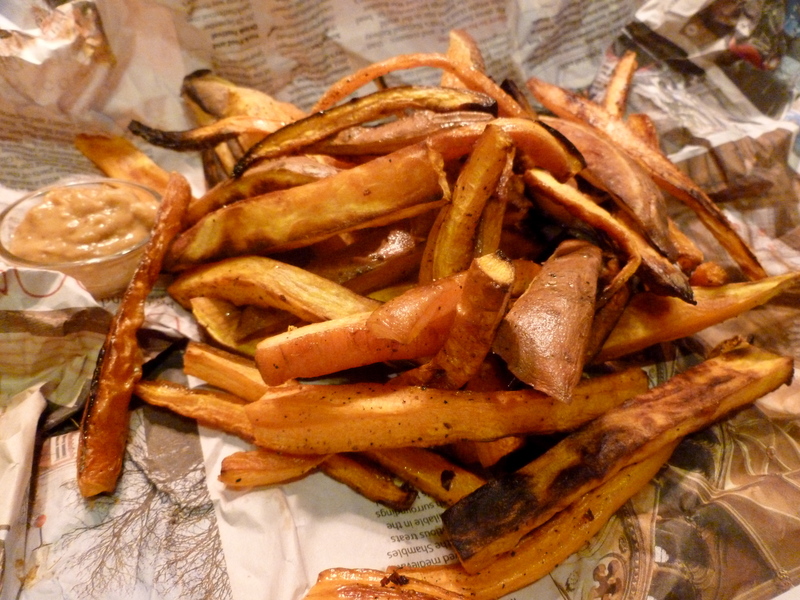 I’ve never had much success making any form of fries – mainly because I’m never quite sure if the oil is hot enough, prematurely dropping the chips into the tepid oil, and inevitably ending up with limp potato sogginess. Oven-baked sounds like a much better idea and carrot and sweet potato makes a nice change too!